This is the final post about the family of my three-times great-aunt Rosa Goldschmidt and her husband Bernhard Metz. In 1900, Rosa and Bernhard and three of their four surviving children were all living together in New York; Bernhard was still in the import-export business, and his sons Edwin and Joseph were merchants. Their daughter Hattie was working as a saleswoman, and her husband George Gattel was a commissioner. Rosa and Bernhard had already lost three of their children: Siegfried had died in 1880, Emily in 1885, and Bertha in 1892; also, their oldest son Paul had abandoned the family and disappeared in 1900. Rosa, Bernhard, Hattie and her husband George, Edwin, and Joseph were all still living together in 1905. Edwin was a “nit goods salesman;” Joseph was a dry goods clerk, George Gattel was some kind of salesman, and Bernhard was a commercial merchant. There were also two boarders and two servants living in the household at 209 East 61st Street. Things changed between 1905 and 1910. We saw that Edwin, who had married Gertrude Becker in 1903, was living in Chicago in 1910. The youngest sibling, Joseph George Metz, also married during those years. He married Florence W. Wolf on December 31, 1905. 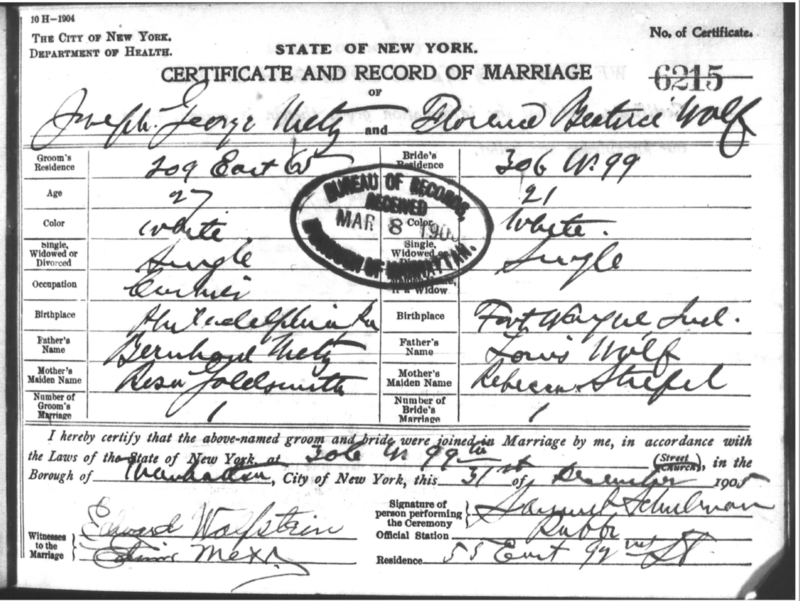 New York, New York City Marriage Records, 1829-1940,” database, FamilySearch (https://familysearch.org/ark:/61903/1:1:2497-DHX : 10 February 2018), Joseph Metz and Florence Wolf, 31 Dec 1905; citing Marriage, Manhattan, New York, New York, United States, New York City Municipal Archives, New York; FHL microfilm 1,558,583. In 1910, Joseph Metz was enumerated as the head of household at 149 West 135th Street; in addition to his wife Florence and their son Robert (2), his parents Rosa and Bernhard were living there as well as two servants. Joseph was a ladies’ underwear manufacturer, and his father Bernhard was working as an insurance agent. Not too far away at 607 West 136th Street, Joseph’s sister Hattie was living with her husband George Gattel; George was now a silk merchant. Living with them was Hattie’s niece, the daughter of her deceased sister Bertha, eighteen-year-old Bertha Katzenstein. As you may recall, Rosa and Bernhard’s daughter Bertha Metz died shortly after the birth of her daughter Bertha from puerperal fever. I don’t know whether the child was named Bertha before her mother died or afterwards in her memory. 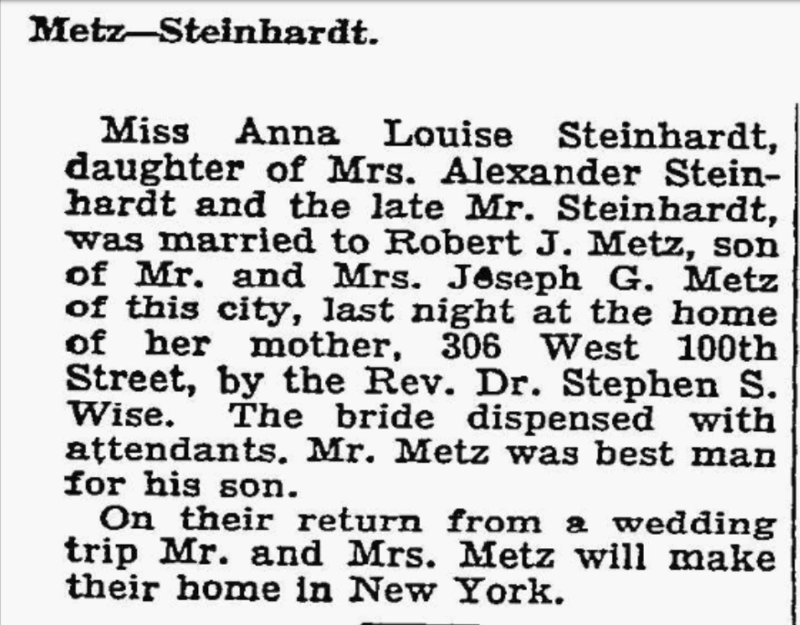 Bertha Katzenstein’s father Adolf had remarried in 1895, three years after the death of his first wife Bertha Metz. His second wife, Lisbeth Schierstad, was a German immigrant like Adolf.4 I could not locate Adolf, Lisbeth or Bertha (the daughter) on the 1900 US census. Since Adolf was in the import-export business and traveled many times to Europe, I suppose that he and Lisbeth and Bertha might have been abroad when the 1900 census was taken. But Adolf and Lisbeth are listed on the 1905 New York State census, and Bertha was not with them at that time,5 nor was she with her grandparents or aunt or uncles. She would have been only thirteen at the time. Was she in boarding school? Still abroad? I don’t know. At any rate, in 1910, Bertha was back in New York City, living with her aunt Hattie. Thus, in 1910, Rosa and Bernhard had only two of their seven children still living nearby: Hattie and Joseph. Paul had disappeared, Edwin was in Chicago, and Siegfried, Emily, and Bertha had passed away. They had five grandchildren: Bertha’s daughter Bertha Katzenstein, Edwin’s son Walter, Joseph’s son Robert, and the two sons of Paul Metz, Elwood and George. On May 16, 1911, my three-times great-aunt Rosa Goldschmidt Metz passed away at age 73 from colon and liver cancer as well as kidney disease. When I first opened this death certificate, I panicked. It showed Rosa’s parents as Jacob Goldsmith and Gretchen Stern, not Seligmann Goldschmidt and Hincka Alexander. Had I been researching the wrong Rosa Goldschmidt? But then I noticed her very specific age—73 years, 6 months, 19 days. Using a web date calculator, I determined that since she died on May 16, 1911, that meant she was born on October 27, 1837. Bingo! 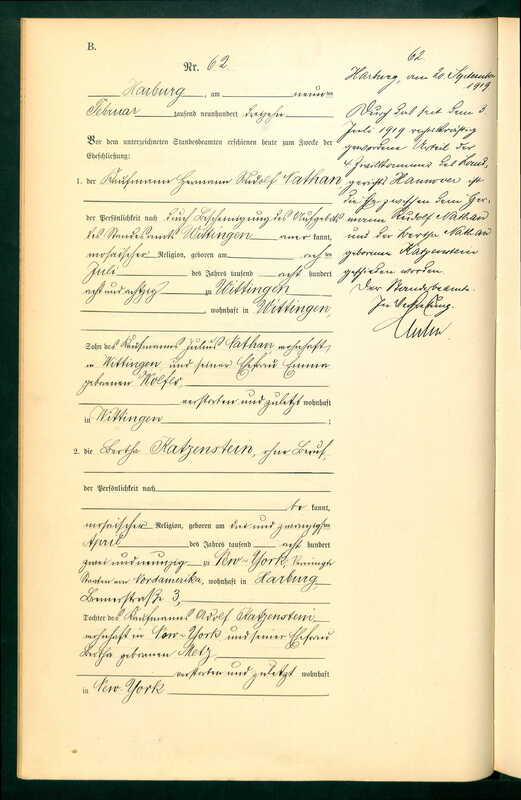 That is EXACTLY the date for Rosa’s birth on the Oberlistingen birth register, showing her parents as Seligmann and Hincka. Phew! But where in the world did the family come up with the names Jacob Goldsmith and Gertrude Stern?? I don’t know. 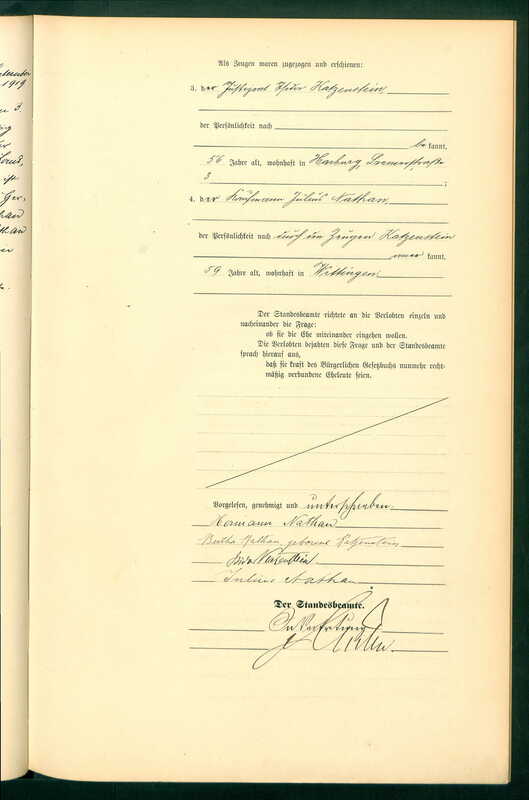 Unfortunately that is the last document or record I have for Bertha Katzenstein. I don’t know whether she returned to the US, but if she did, I can’t find her in the US nor can I find her in Germany—not as Bertha Nathan or Bertha Katzenstein. If she remarried, I have no record of it and thus do not know her married name. Ancestry.com. Hamburg, Germany, Marriages, 1874-1920. In 1920, Hattie and George Gattel were still living in New York City, and George was still selling silk. Ten years later they were still living in New York, and George was no longer working.8 Hattie died on December 11, 1930, at the age of 66;9 George died less than a year later on September 24, 1931.10 He was seventy. Having lost both of their children as babies, they have no direct descendants. Joseph Getz, the remaining and youngest sibling, must have hit some hard times after 1910. In 1915, he and his wife Florence were living with Florence’s mother and brother Milton at 243 West 99th Street, and Joseph had no occupation listed on the 1915 New York State census.11 Their two young children, Robert, who would have been eight, and Rosalind, who was two, were not listed with them nor can I find them elsewhere on the New York State census. Could they have been omitted by mistake? Or were they living some place outside of New York, perhaps with a different relative? I don’t know, but in 1920 Robert and Rosalind were again living with their parents in New York City; Joseph was now a commercial traveler. Florence’s mother Rebecca Wolf was also living with them.12 In 1925 they were all still living together, and Joseph was now an insurance broker.13 Five years later the 1930 US census shows them all living at the same place, Joseph still working as an insurance broker. Joseph and Florence’s two children married in the 1930s. 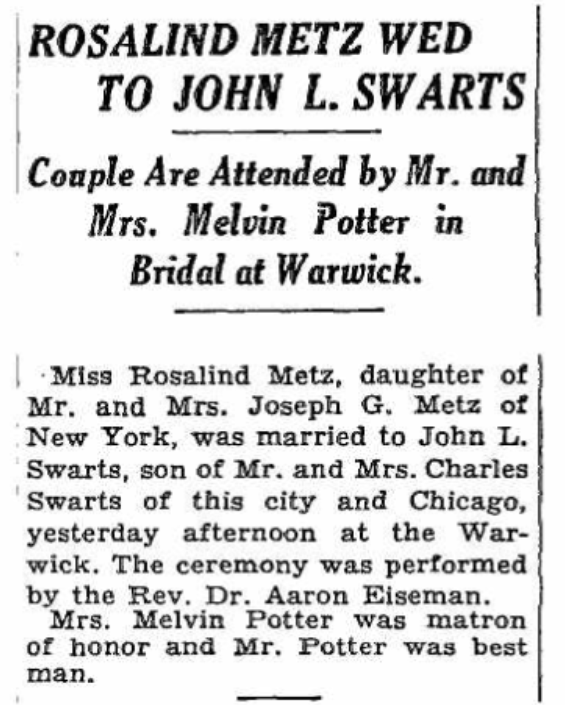 Robert married Anna Steinhardt on June 29, 1934, and Rosalind married John L. Swartz on June 2, 1935. Sadly, the decade ended with Joseph’s death on March 4, 1939. He was sixty years old.14 His wife Florence outlived him by more than 25 years, dying at 85 in September 1965.15 They were survived by their children and grandchildren. With that, I come to the conclusion of the story of Rosa Goldschmidt, her husband Bernhard Metz, and their seven children. It was quite a wild ride at times. Rosa’s children faced many challenges and provided me with many research challenges. She was the youngest child of my three-times great-grandparents Seligmann Goldschmidt and Hincka Alexander. She was the second to last of their children to come to the US. Her oldest sister and Seligmann and Hincka’s oldest child, Sarah, was the very last of the Goldschmidt siblings to come to the US. Her story comes next. Hattie and George Gattel, 1920 US census, Census Place: Manhattan Assembly District 7, New York, New York; Roll: T625_1197; Page: 8A; Enumeration District: 555. 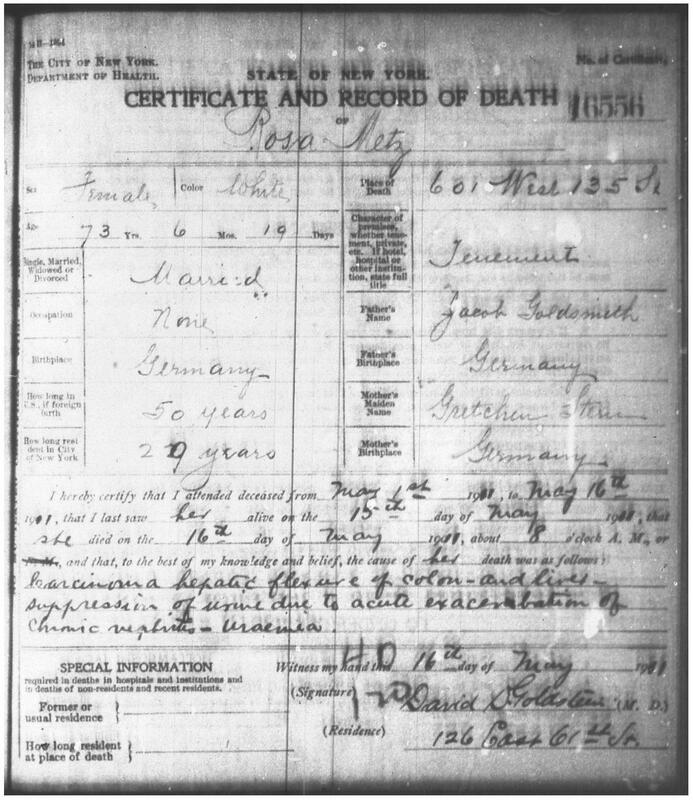 This entry was posted in Genealogy, Goldschmidt/Goldsmith, New York and tagged Death certificate, Goldschmidt, Goldsmith, Metz, New York City by Amy. Bookmark the permalink. 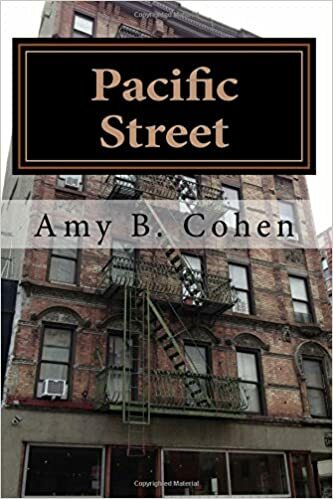 Congratulations on bringing the Rosa Goldschmidt story after many challenges to your detective skills to a successful conclusion. Of course, as with all research in genealogy, many questions will for ever remain unanswered. Have a great day, Amy! Thank you, Peter. That is what makes such a challenging and fun project—there are always more questions. That is frustrating about the “disappearance” of Bertha from records. That’s the problem with women taking their husband’s surnames haha. I mean it’s likely that that is what happened. As far as Edwin working in “nit goods,” I was wondering if nits need their own little clothes and furniture ;). No spelling tests for census workers, I assume. Wonderful work as usual, Amy. Having dealt with a colony of huge nits in one of my kids’ heads, I can say that those guys already have their full war gear on and don’t need any help from anybody. The surname problem is so real in genealogy. Please—don’t remind me. When Maddy was in 5th grade, it kept going around the entire grade. We finally cut her hair short! Haha, yeah, what a nightmare. My daughter got a special case from New Jersey camp–huge and OTC nit killer did not touch them. Right at the time of brother’s bar mitzvah, too. Never a good time, but that’s awful! Ugh. It seems like three years to me. Amy, I expect finding the wrong names for the parents on Rosa’s death record was great cause for panic. But think of it this way, at least you noticed it right away, worked it out, and didn’t ignore it. Some would have not even noticed this or if they did would have immediately discounted it as the correct person. Good work! I’ve had a few battles with ‘nits’ as well, also having to check heads during my career in school…back to the blog and the mention of Rabbi Dr. Stephen S. Wise who married Anna and Robert Metz. Wise is who the Jewish Louise Wise Adoption Agency (NY) was named for. First the Free Synagogue Adoption Committee – started by his wife Louise Waterman Wise This was the adoption agency I was placed with. You had me with this – Awesome blog post! Wow, I had not noticed that Stephen Wise performed the ceremony. He is extremely well-known, perhaps best known for speaking out against the Nazis and trying to get FDR to do something about it, just in the period that he married Anna and Robert. Impressive! Thanks for pointing that out!! Amy, your enthusiasm and skill ” never ceases to amaze me”!. Love, Daddy. They were Rosa’s parents? I don’t know how you keep all the names straight at the pace with which you make new findings and create the postings! Hi Emily—I am confused by your question. Yes, Seligmann and Hincka were my 3x-great-grandparents, and Rosa was their daughter. That’s why I was thrown by Rosa’s death certificate which named her parents as Jacob and Gretchen! My guess is that when she died, no one knew her parents’ names as Seligmann and Hincka had never left Germany so the grandchildren never knew them. Whoever was the informant just made up names, I assume. Seligmann and Hincka never changed their names. As for how I keep the names straight—I always have my family tree and the blog to refer back to as I am writing new posts. But for Seligmann and Hincka, I knew those well since the last ten months or so I have been focused just on them and their children and descendants! Hi Amy. You read and answered my question correctly. Thanks. Sorry if I am a bit fuzzy-wuzzy lately. There’s a lot at work so I’m reading up during lunch and posting on the go. I understand! I just worry that I haven’t been clear in my writing. 🙂 Thanks as always for reading and for your feedback. Never worry, Amy, you’re doing fine. I just cannot believe how you put all the pieces of the puzzle together and then wrap it up with a bow.